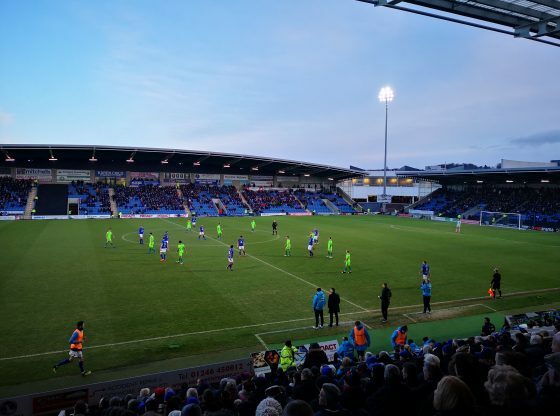 John Sheridan was measured in both his praise and critique, as he reflected on Chesterfield’s narrow home victory against Halifax. 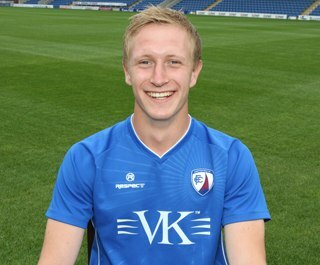 Debuts for Scott Boden and Ellis Chapman, together with a 352 formation, saw a much improved performance from the Spireites, although Halifax were no pushover, with their lively number 7 Kosymo proving a constant threat in both open play and from set peices. Despite enjoying the majority of possession and some positive wing play from debutant Chapman, first half opportunities were sparse, with only two chances worthy of note. A quick, surging right sided run from the tireless Shaw culminated in a decent save from the Halifax goalkeeper. Close to half time, Fortune then impressed with a smart turn before dragging his low shot narrowly wide. Chesterfield dominated for the majority of the second half, providing waves of forward play but without demonstrating any real goal threat. With the pressure mounting on Halifax, Boden was then bundled over by Matt Brown. Boden got up, immediately grabbed the ball and successfully punched the spot kick hard and to the right of the Goalkeeper, before celebrating with glee in front of an appreciative kop. Many fans noted that Manager Sheridan could not watch the penalty as it was being taken, choosing instead to stand with his back to the play, until he heard the roar of the celebrating crowd. Substitute Denton, who came on to a warm reception, almost grabbed a second with a smart flick with his left foot. This preceded a nervy last ten minutes for the hosts, with Halifax getting the ball forward directly, quickly and winning a few corners. The delicate confidence of the home side was apparent, with a clear lack of calm and unnecessary misplaced passes seeing the crowd especially happy and relieved when the full time whistle sounded. In his aftermatch press conference, Sheridan gave some insight into his coaching attitude, as he expressed views to match many of those expressed by the fans at points during the season. The popular and hardworking Shaw needs to bring intelligence and quality in his final delivery, and effective play it’s not all about energetic running. Midfielder Smith was also praised for his all action style but the insuation was that Sheridan is looking for more composure and quality on the ball. Sheridan’s league record now stands at 2 wins, 1 draw and no goals conceded. Only the FA Trophy embarrassment against Brackley has spoiled an encouraging start.